Fallingwater house or Kaufmann Residence, location is one of the most amazing things about it, built partially over a waterfall Bear Run in Mill Run, Stewart Township, Pennsylvania. The building was designed by architect Frank Lloyd Wright in the year 1935. The house was constructed as a weekend home for the Kaufmann’s department store owner’s family. This building was recognized as a National Historic Landmark in 1966. 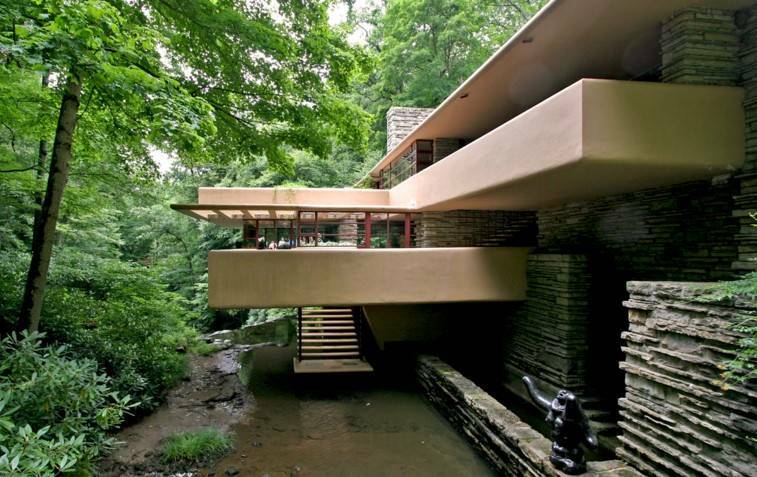 Since then, the Fallingwater house has received various recognitions, such as AIA named it the “best all-time work of architecture”. Frank Lloyd Wright design for this house gave him a place among some of the most prominent architects in the architectural community. The Kaufmann’s owned a property with a waterfall nearby Pittsburgh, which had cabins, where they used to go for some family time. But when these cabins were no longer in a condition to be lived, Mr. Kaufmann got in touch with Frank Lloyd Wright and discussed the plans of “Fallingwater house”. As soon as both agreed over the idea of the house being constructed over the fall, rather than on the southern bank of Bear Run, the architect started with the further design and the Fallingwater house plan. The final designs for the Fallingwater house were confirmed by the architect in March 1936, and the work for the foundation and the house commenced in April 1936. There was a problem with the location of the building on the north bank of Bear Run, as it does not have enough space for the foundation of this house visioned by Wright. The solution to this problem was a cantilevered structure. 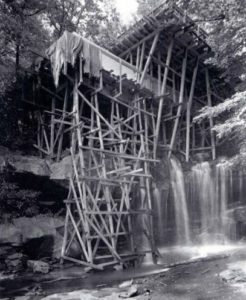 Wright along with his staff engineers Mendel Glickman and William Wesley Peters undertook the structural design of Fallingwater house. Wright has teamed up with them for one of his most revolutionary work in “Johnson Wax Headquarters”. During the construction of the house, there was a fallout between the Frank Lloyd Wright and the owner Mr. Kaufmann. Believing that Wright has less experience with reinforced concrete structure, Mr. Kaufmann had a team of engineers reviewed the design and plan of Fallingwater house structure from an engineering firm. Frank Lloyd Wright, on receiving the report from them, took offense and told Kaufmann that he wants to be removed from this project and wants back his designs for the Fallingwater house. Kaufmann eventually complied with the architect and discarded the report from the engineers. Upside-down T-shaped beams along with concrete slabs were used for the cantilevered floors, that also act as the floor above the waterfall. On the contractor suggestion and Kaufmann’s request, the consulting engineers doubled the amount of reinforced steel in the first floor’s slab without Wright’s approval. As a result, when concrete formwork was removed the cantilever had an eye-catching downward swing. The solution to this was that the top course of stones had to be removed from it and a supporting wall was placed under the main beam. The architect used only four material in the house including reinforced concrete, glass, sandstone, and steel. The sandstones were placed 500 feet westward of the waterfall in a manner that it would seem as they were emerging from the ground itself. The steel used in the house was painted red as per the Wright’s suggestion, as it would make it look closer to iron ore, from which the steel is made. The glass was used instead of putting up walls in the steel frame, to make the house less heavy and which also allows the outside view to flow freely into the eyes of the person living in it. The concrete structure of the house was painted in pale ochre color to resemble a fallen rhododendron leaf back. The house interior consists of rooms that are furnished by the Fallingwater architect himself, it also consists of a living room and a kitchen on the first floor. The house has a total of three floors, the second floor features three medium sized bedrooms and the third floor is used for the study and bedroom of the owner Edgar J. Kaufmann’s son, the Edgar Jr. The ceilings of the rooms do not reach a great height, with it being 6’5″ at some places. This was done by the architect Wright in order to make people appreciate the beauty of nature through the house. 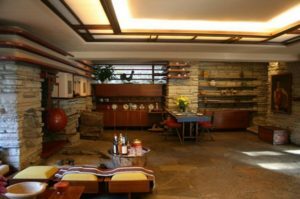 The Fallingwater house’s design is centered around a fireplace, that has got its place in the living room at first floor, which serves as the place for the family to sit together and have some family time. Near the fireplace, a rock is placed in a way that it gives the feeling of bringing the waterfall in the house. The chimney extends all the way to the top above 3rd floor making it the highest point on the house exterior. The Fallingwater house exterior boasts a strong horizontal brick design alongside the terraces. 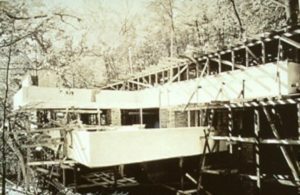 The construction for the Fallingwater House or the Kaufmann House completed in October 1937. The total cost of the house came to be $155,000, out of which $75,000 was used for construction which was much higher that the estimated cost of $35,000 and the rest was used for furnishing, interior, architect and engineer fees. 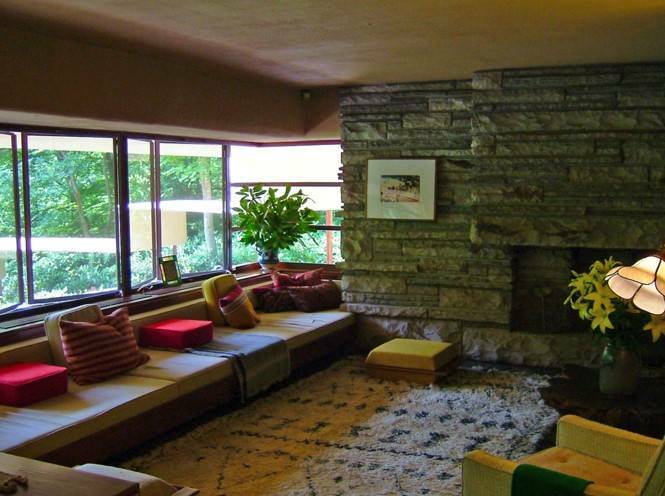 The Fallingwater house stands as one of the greatest work of the architect Frank Lloyd Wright. The Fallingwater house design clearly reflects the Wright’s affection towards the Japanese architecture. Even the architect Tadao Ando stated that he feels the house space is a reflection of Japanese architecture, with an additional sound of water falling. The sound of the waterfall can be consistently heard in any part of the house. The Fallingwater house restoration began in 1988. as the house had suffered some serious damage, and being a National Historical Landmark it had to be preserved. The house was temporarily restored with the help of girders, that were placed beneath the cantilevers to withstand their weight. However, the structure was completely restored in 2002 using the post-tensioning technique.